Unsurprisingly, there are lots of ways to use visuals – as images, videos and even GIFs. 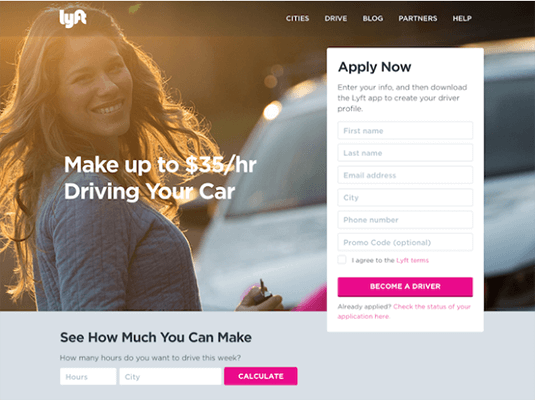 In this post, I’ll show you 16 creative ways to use visual elements in your landing pages. 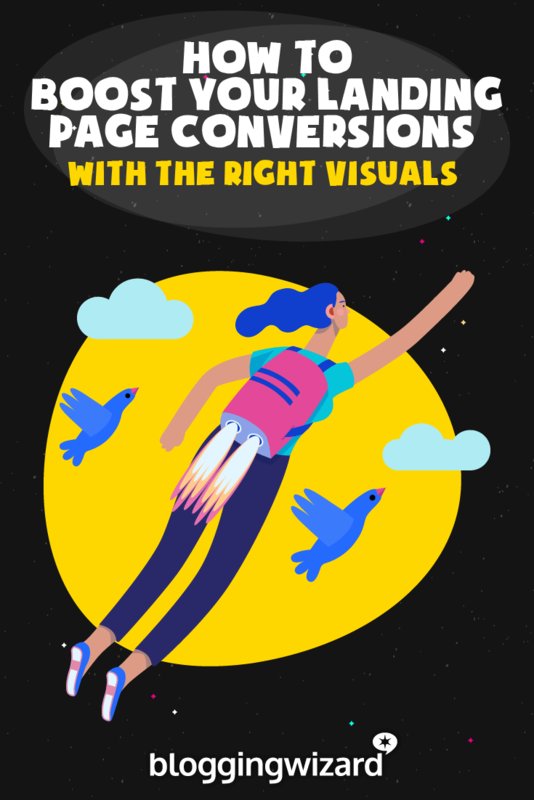 I’ll also show you how to make the most of each visual element so you can squeeze better conversion rates out of your pages. 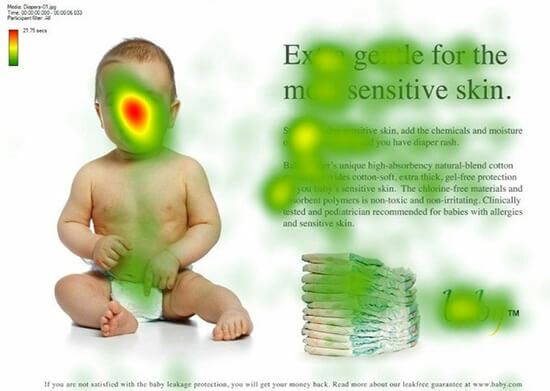 This is how you’ll usually use visuals on your landing pages – as images. Images have the dual benefits of capturing attention and amplifying your message, while also being easy to use and fast to load. And page load times are a big deal for user experience! 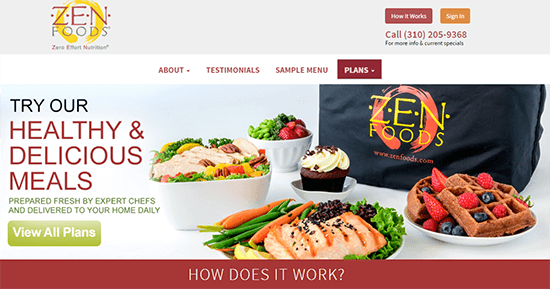 Throw in the fact that images are readily available, easy to edit and cost next to nothing to produce (when compared to video), and you can see why they are the mainstay of landing pages. So what kind of images can you use on your landing pages? We are hardwired to notice faces. A face is almost always the first thing we see in any image. We empathize with others based on what we see, especially in the form of images. This behavior makes pictures of people a particularly powerful tool to create empathy, hold attention and direct it to an important element on our landing page. 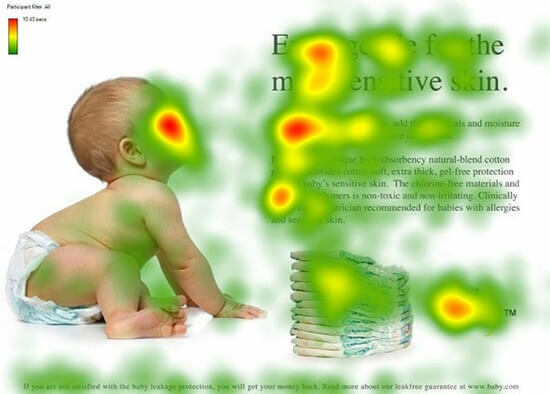 For example, an eye tracking study of a landing page with a baby showed that when the baby was looking straight, the viewer all but ignored the text on the page. Instead, the baby’s face counted for all the attention. When the image was shifted so that the baby was facing the text, visitors first looked at the baby (i.e. the face got their attention). Then they followed the gaze of the baby’s eyes to look at the text. This is a great example of our tendency to notice faces and follow their gaze. Showing visitors that your customers are ‘just like them’ can bridge the empathy gap. This means that it’s easier for them to identify with your products and visualize themselves using it. The result? Higher conversion rates. 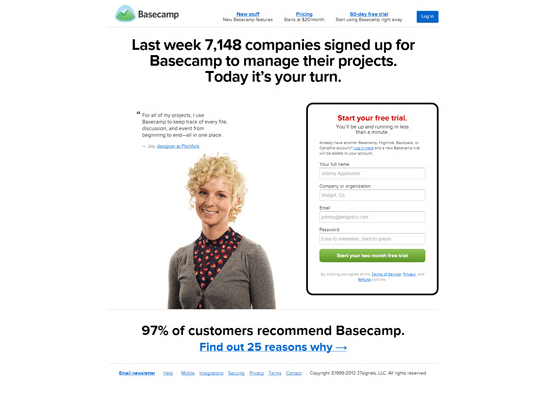 One way to do this is to show either existing customers or an idealized version of the customer (based on your personas) on your landing pages. Whenever possible, use an actual customer rather than an ideal target customer – it feels far more authentic (or at least, it does to me). And if in doubt, use split testing to see what works best. How do you show that using your products make people happy? Simple: use an image that portrays your target emotion. This is a stable of modern advertising. You see happy people in car commercials because that’s what car companies want you to feel about their cars. It’s similar to the ‘before’ footage in TV infomercials. They’re filled with unhappy, frustrated people because that’s the emotion the company wants to amplify. So, when using pictures of people, try to show an emotion you want your customers to feel. You see a wide range of actions in the image, but the people are all uniformly happy – the emotion HomeAway wants you to feel. Certain types of pictures immediately capture our attention, especially if they are bold, dramatic or appeal to desires. Why? Because research shows that attractive faces capture our attention. It’s important to know that this approach can backfire as well. If the CTA isn’t compelling enough, a visitor might not notice it and focus attention exclusively on the model. If you’re going to use this approach, make sure that your CTA and offer is strong enough. You can also use gaze following by making the model look towards your CTA. The most famous example of the ‘founder as an image’ is, of course, KFC. The Colonel’s image is everywhere in every KFC. 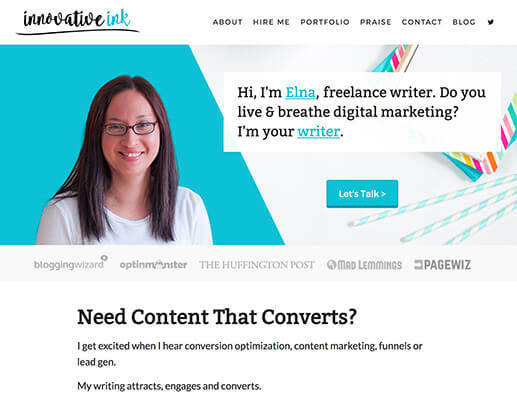 On a smaller scale, you’ll see bloggers and authors often use their own pictures on their landing pages. Before they buy a product, your customers naturally want to know what it looks like and how it works. 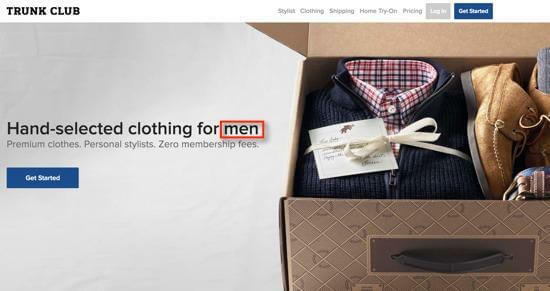 This is why product images are so popular on landing pages. They showcase the product (even if it’s a digital one) and help buyers get a feel for how it works. 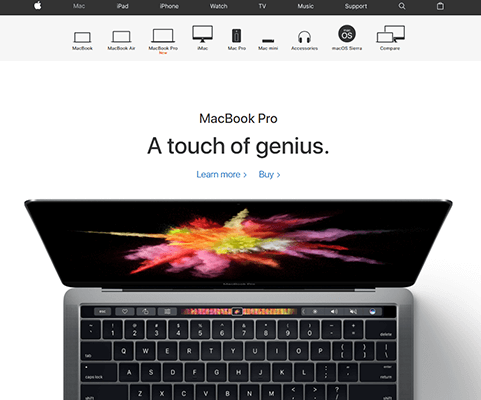 This is the most common way to use product images on landing pages – showing what the product looks like and how it is used. You can either use a stand-alone image of the product or show people using/wearing it. You’ll want to choose the last option if you want people to visualize the product (such as closing or accessories). In the examples above, the product doesn’t have a unique enough design to hold its own. This is why a model is needed to help you visualize it. If your product is unique or has a new take on a problem, you would want to show people how it works on your landing page. For example, the original Square landing page showed how the product worked because at that time, accepting cards on a phone was a rather revolutionary idea. 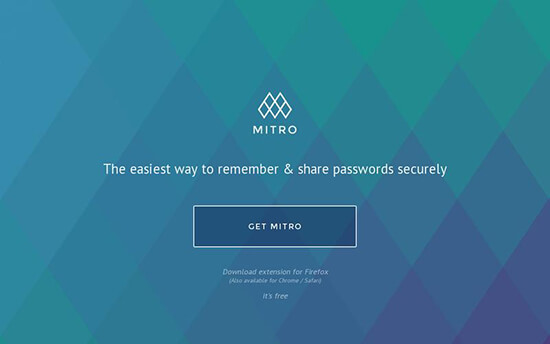 The product-centric design works here since it helps showcase the product’s unique features. 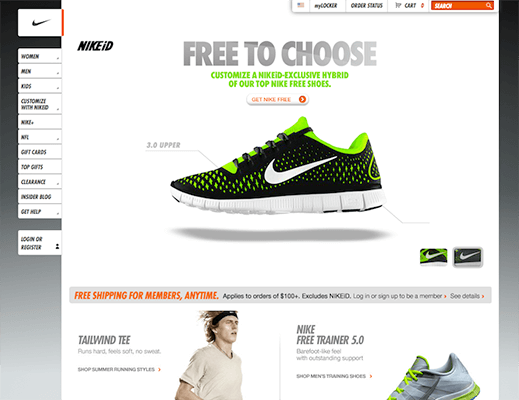 In both of these cases, the landing page highlights the product’s design and features. This wouldn’t work for a generic design but it works for companies like Apple and Nike. But what if your product is nothing exceptional in terms of its design or value proposition. A great option in these circumstances is to focus on the packaging or show the product in context. For example, this landing page from Winc shows the product in its complete packaging. The packaging part of the company’s USP, not the wine. 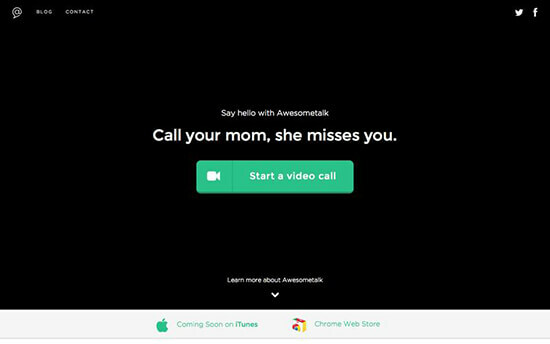 And this landing page highlights that. Visualize it as a physical product, such as an eBook Photoshopped to look like a physical book. Visualize its contents. This works particularly well for software products where you can show the UI. 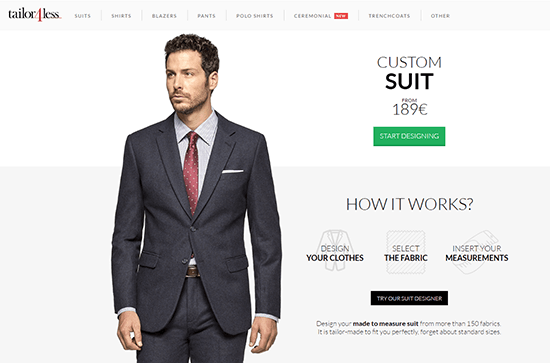 Visualize the product in context, i.e. show where and how the product is used. This is a common trend with eBook landing pages since it helps to visualize the product. It also helps give the impression of higher value. Software products usually show the product’s interface, mostly on a specific device (laptop/iPad/phone). Another alternative is to show the product actually being used by a person. This places the product in context and helps customers understand it better. In this context, ‘abstract’ imagery means any image that does not have a clear relation to the product. Think of ‘hero images’ you see on Unsplash.com. These images work because they are beautiful to look at and capture attention. An image of a landscape or other unrelated imagery doesn’t do anything for your product. And it doesn’t amplify the emotion you want to create. It does, however, create an interesting backdrop for your copy. It might not capture attention the same way as a picture of a smiling model, but it does create appropriate ‘busyness’ on any page. When done right, it can also be paired with the copy on the page to help readers visualize it. 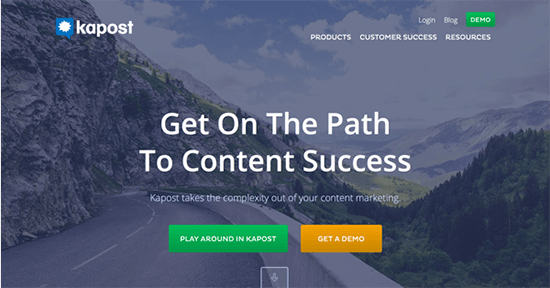 For example, Kapost’s landing page shows a road. This aligns with the copy on the page – the ‘path’ to content success. An abstract or plain background helps your text stand out while complementing the design of your page. Since backgrounds like these are small in terms of file size, they load very quickly. This can be useful for mobile visitors and those with slow connections. The background is a solid color which helps place the spotlight on the copy. If given a choice, a lot of people would prefer to watch a blog post in video form rather than read it. Videos reduce the level of effort visitors need to put in to understand your message. This leads to a greater understanding of your offer. For marketers, the benefits of videos are obvious. They help you demonstrate your products better. They also help you use better storytelling techniques (such as animation) to tell your story. They cut out users with low network speeds, especially mobile users. They cut out users who might not be able to use headphones/speakers. Despite these flaws, videos usually improve landing page conversion rates, sometimes by as much as 80% according to one study. It’s good practice to include an alternative to video or to show the video only if the user requests it by clicking a button. This will ensure that you don’t lose any visitors. And while videos are typically more expensive to produce, technology has come a long way. It’s possible to get a camera that takes high quality video without spending much. Then, there are plenty of tools available that make video editing easy (and budget friendly). This is the most common way to use video on landing pages – to show what the product looks like and how it works. You’ll want to use this especially for innovative products. But, most users don’t want to sit through a 10-minute video. Reassure them by showing the length of the video. For example, Swagbucks, tells users that its video is exactly ’43 seconds’. This is a great way to reduce their resistance. A growing trend in landing page design is to use videos as the page background. This adds a deeper level of emotive and visual complexity to the design. But it can hurt page load times, so it’s good practice to use a content delivery network or a dedicated video hosting platform for your videos. You’ll also want to have a static alternative for slower connections. One way to use video backgrounds is to show a product in context. For example, Touch Bistro, shows its POS product being used in a restaurant. This helps customers understand how the product works. Another approach is to use a background that doesn’t showcase the product or its users but adds visual complexity to the page. 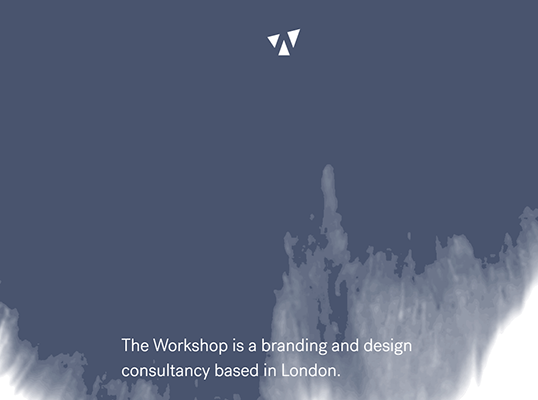 A good example is Workshop’s landing page. 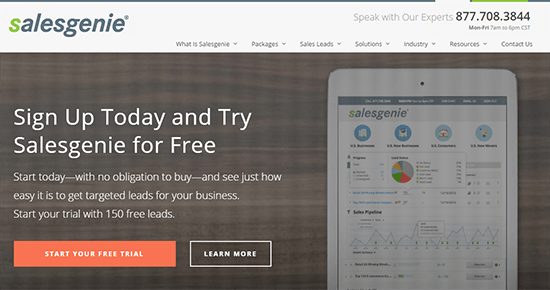 You’ll find examples of this approach on sales pages. Usually, it will involve a narrator (seen or unseen) making a pitch with the aid of video. 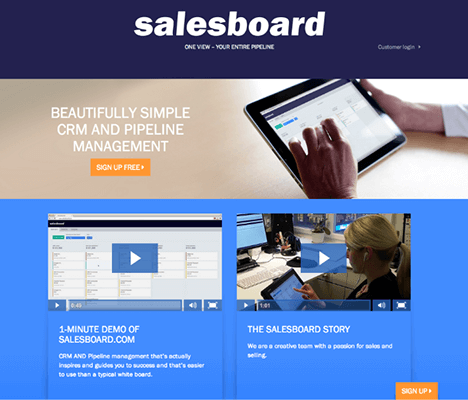 Essentially, this is a long-form sales page in video format. 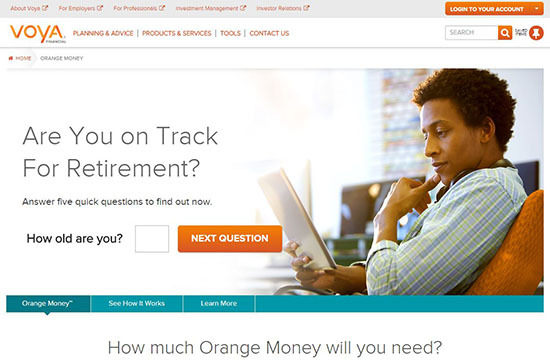 For example, Thrive Themes uses video on most of its product landing pages. These videos help demonstrate how the product works and pitch its core value proposition. 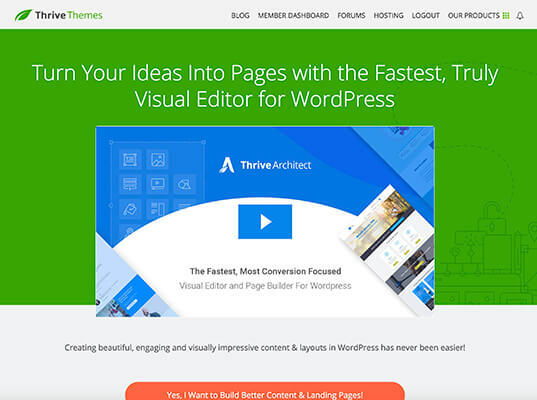 On a side note, if you’re looking for a tool to build landing pages within WordPress, be sure to check out our write up on Thrive Architect. Testimonials show that the product or service provides real value to others and may lead to similar results for you. They’re a great form of social proof. Video testimonials outperform both text and audio testimonials. While it’s easy to create a false text testimonial, videos are harder to fake, which leads to higher trust. For example, Scorpion Internet Marketing, shows an actual client discussing their experience working with the company. 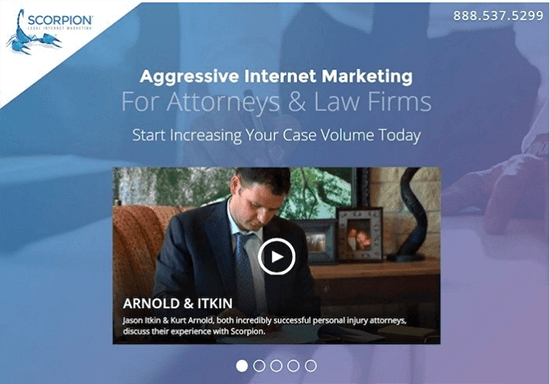 In a competitive field (internet marketing) with low trustworthiness, this video testimonial adds authenticity to their messaging. They were created in the late 1980s and quickly embraced by the internet community. However, their use as a marketing strategy has only recently begun to gain traction (thanks, Buzzfeed). These small animations offer a ‘middle-ground’ between images and videos. They are cheap to create and often more engaging than still images. 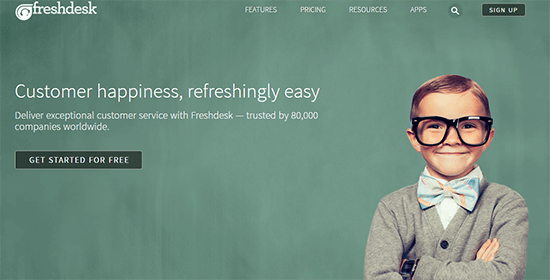 Besides engagement, these small animations let you target an exact emotion within your visitors. My go-to tool for creating GIFs right now is CloudApp. The entire GIF creation process is extremely fast. They have a free plan that lets you create GIFs up-to 15 seconds long. You can also use this tool for screenshots and screen capture videos (unlimited screenshots/videos on the pro account). The only issue I’ve found so far is with the file-size of GIFs, so some of the following are displayed as images instead. In some cases, you might be able to use a GIF to showcase your product and its core benefits. This is usually the case with digital products. 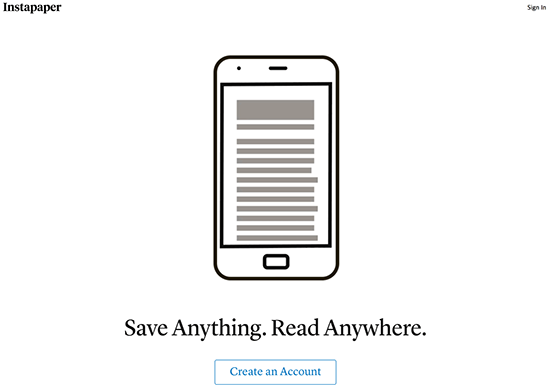 For example, the Instapaper landing page shows the product’s core feature – the ability to ‘read anywhere’ – with an animated GIF. A GIF works better than video in this situation because it’s easier to animate. And, since the GIF has only limited colors, its file size is also smaller (remember, page load times matter). With this approach, the GIF works like an autoplay video. Instead of getting people to hit ‘play’ on a video, you can use a GIF to show your product in action. Since a GIF needs to be a relatively small file size, you will have to limit which features you show off. Consider showing only the most important features instead of a complete demo (where a video would work best). Another way to use GIFs is to add visual complexity to an otherwise basic page. The GIF usually replaces a static element on the page and makes it more visually interesting. For example, this landing page from Bench could have just used a static image (which they do offer to some users based on their location or device), but the GIF makes the page far more interesting. 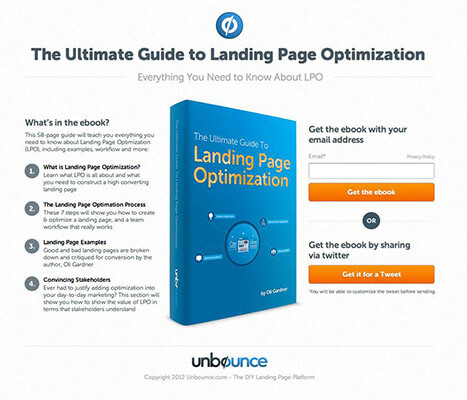 In order to drive conversions, a landing page needs to be visually engaging and dynamic. Adding GIFs, images and videos to your landing page can increase its emotional impact, highlight your copy or CTA and add visual complexity. 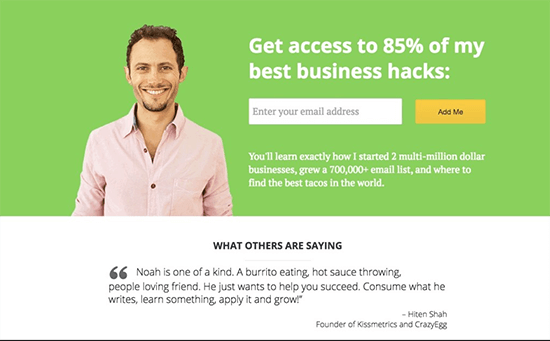 Use the examples above to inspire the design of your next landing page – what will you create?